1) Boil the macaroni in a separate pot of water. 2) Cut the luncheon meat into slices. Pan fry it and put aside. 3) Boil a pot of water and add in chicken stock when the water is boiling. 4) Add in the mixed vegetables. 6) Just before I switch off the stove, I added 1 tablespoon of cooking wine into the soup. Add some spring onion and fried shallot. 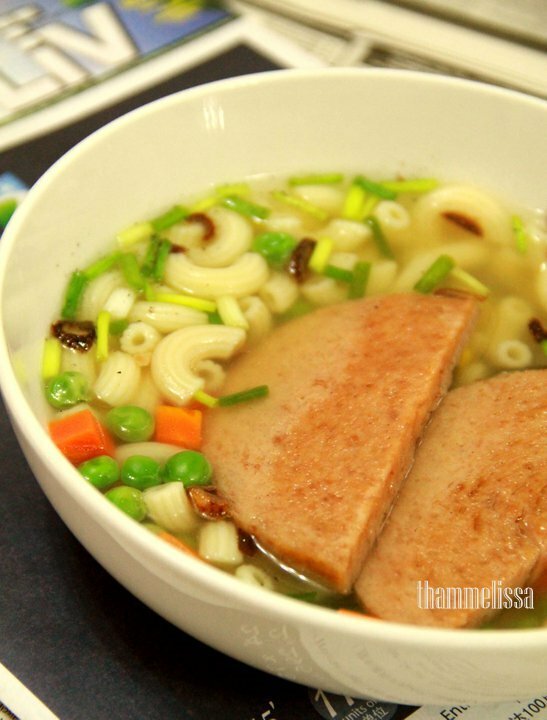 Finally, place 2 slices of luncheon meat onto the macaroni with soup. I do this sometimes when I am not in the mood for cooking, get anything in the fridge and join them together!